Here it is, October 1st. It was 97 degrees in LA today, 111 in the valley. Just brutally hot, and here I am, wishing it was a little cooler. A little more fall like. Walking outside today was like walking on the surface of the sun. So, this post will be in the ‘spirit’ of cooler weather; in dedication to the cooler New England nights that a lot of my friends and family are experiencing right now. Don’t get me wrong, I love the temperate Southern California weather (especially in winter), but once in a while, we need a cool rainy day. Balance is key, after all. Cooking this recipe will perfume your house with that incredible fall fragrance we all love: pumpkin spice. No matter where you are, this is truly a feel-good, warm your house recipe. And once again, your house will smell like a Yankee candle. Except this time, you also have something wonderful to eat later on. 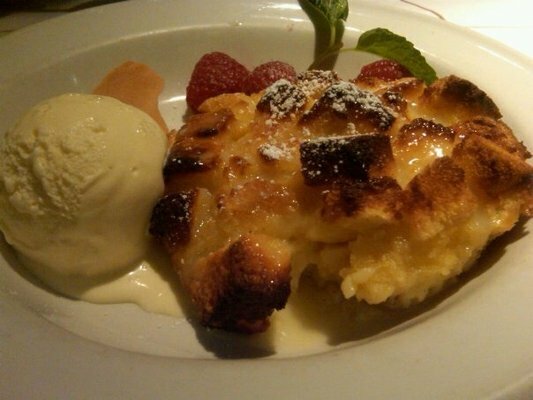 Bread pudding is a rich custard, similar to ‘dressing’, or ‘stuffing’, but in a sweet pastry way. Of course, we can make savory bread puddings, but in this case, let’s stick to what’s common. Bread: Good sour dough loaf bread. Pumpkin puree. Cinnamon, nutmeg, and cloves. White chocolate and dried cranberries. As beef rendang is all things good southeast Asian, this bread pudding is all things good fall in New England. On a personal note, I do not like mine exceptionally sweet. It’s rich, and has a dynamic natural flavor, and doesn’t need a lot of additional sugar. Remove the bread crusts and cube the bread. Whisk together the cream, eggs, spices, sugar, salt and pumpkin puree. Pour the custard over the bread, cover and let sit for 3 hours, stirring once an hour.The bread should almost be covered with liquid when you begin. If it is not, add a little more cream. Heat an oven to 375. Grease a heavy baking dish. Mix in the white chocolate and cranberries with the bread and custard. Pour everything into the dish and bake, about 1 1/2 hours (or longer if necessary) until the pudding is set and semi-souffled (puffs up in the center). Let cool completely. Serve right away, warm. I love to serve this with very good quality vanilla ice cream and toasted walnuts.